This summer I visited Greece and the Oracle of Delphi at the temple of Apollo. 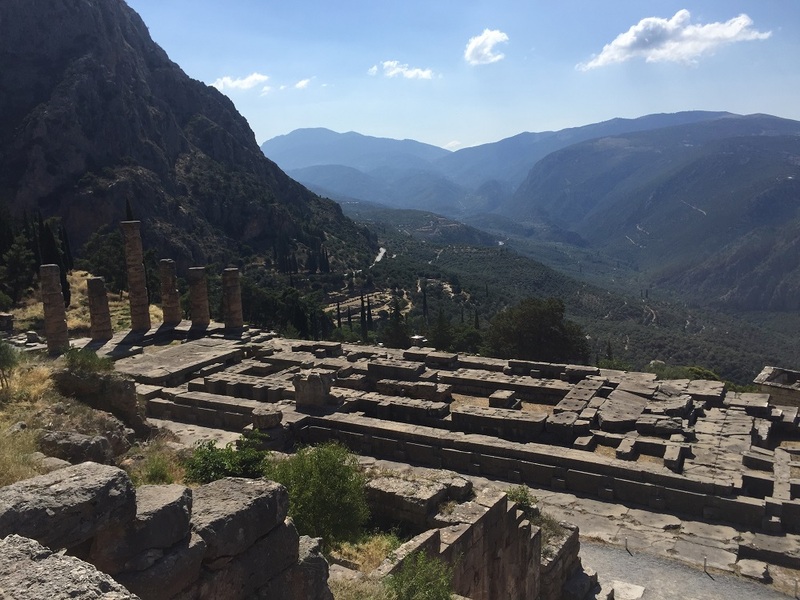 The guide told us that the Oracle of Delphi was consulted for predictions from the seventh century B.C. until the fourth century A.D. That really impressed me: a prediction engine that operated for over 1,100 years, significantly more than modern machine learning prediction engines. However, it did have a number of features that were very similar to our modern equivalents. Supplicants that needed advice from the Oracle had to travel to Delphi. After they arrived, they were interviewed about their questions to make sure they were suitable, a bit like a modern data cleansing procedure. They also had to present gifts to the Oracle. You could think of this as the first version of a pay-per-request, results-as-a-service prediction engine. These formalities over with, supplicants could ask their questions to the prediction engine, Pythia. Pythia was a priestess sitting on a tripod inhaling the gases that came out of a hole in the floor of the temple of Apollo. This gas put her into a state that allowed her to answer the supplicants’ questions apparently based on Apollo’s influence. Every prediction and every forecast that is made has some uncertainty attached. This is true whether they have been made by rules from expert systems, machine learning models or the Oracle of Delphi. In data science, we quantify the uncertainty by calculating confidence intervals around the expected values. These allow us to assess whether the value of interest is expected to lie within a broad or narrow range of value. Pythia handled uncertainty in a different way: Her predictions were expressed very vaguely and ambiguously. This meant she was likely to be correct whatever happened, preserving her reputation. For example, Croesus, king of Lydia, asked the Oracle whether to pursue a campaign against Persia or seek an alliance. He received the advice that if he attacked the Persians, he would destroy a great empire. Croesus interpreted this as a clear advice to pursue the campaign, but he was defeated by Cyrus. A powerful empire was destroyed – his own. This could mean that this marketing campaign is the ultimate tool to boost your sales. I am not saying that we should go back to formulating business predictions very vaguely. I do, however, think it is worth remembering that uncertainty in predictions is nothing new. It is certainly not a side effect of machine learning models. Understanding this is crucial to the use of these models. I think it is worth remembering that uncertainty in predictions is nothing new. It is certainly not a side effect of machine learning models. Understanding this is crucial to the use of these models. Another interesting parallel between Delphi and modern prediction methods is in the process of formulating predictions. Pythia herself did not formulate the final predictions given to her visitors. She was, in practice, often fairly “high” on the gas coming out of the hole in the cave, and therefore spoke more or less in gibberish. Priests “translated” this gibberish into poetic dactylic hexameters for the supplicants. Machine learning predictions, although less incomprehensible to data scientists than Pythia’s predictions to the priests, also have to be translated into language that is understandable by businesspeople. This is a very important step when putting machine learning models into production because this drives actions. There is just one other amusing connection that occurred to me. Once the Oracle of Delphi started to gain a reputation, the number of visitors increased. This resulted in too many inquires to be handled by a single Pythia. The Oracle of Delphi managed that in a very simple way: by increasing the number of Pythias above the cave to three instead of one. I don’t know, but I think this may be the first recorded case in history of parallel processing being used to handle increasing workload for a prediction engine.